FACT CHECK: Is The Current Drug Epidemic The ‘Deadliest’ In US History? “We’ve seen nothing like it,” he said in an address to the National Alliance for Drug Endangered Children. He discussed a range of Department of Justice initiatives to combat the epidemic in the remarks. The last time drug use reached epidemic proportions was during the 1980s and early 1990s. The new drug “crack cocaine” or simply “crack” – a processed and significantly cheaper version of the already popular cocaine – proliferated throughout American cities and towns. This more affordable and accessible drug quickly swept the nation, sparking then President Ronald Reagan’s infamous “war on drugs” in 1982. The Reagan Administration’s efforts, however, failed. Data from the Office Of National Drug Control Policy (ONDCP) reveal that deaths from “drug-induced causes” – overdose – increased. In 1984, 7,892 Americans died from overdose. Overdose deaths jumped by almost 40 percent to 10,917 just four years later in 1988. As debilitating as the crack cocaine crisis was, it was not nearly as deadly as the drug epidemic afflicting Americans today. How opioid abuse in the U.S. reached crisis level is debatable, but a rough starting point for the ongoing epidemic is 1995. The Food And Drug Administration (FDA) had then approved a new painkiller by Purdue Pharma branded as OxyContin. Vice President at the Hudson Institute Brian Blake told The Daily Caller News Foundation that the early opioid epidemic was rooted in “over-prescribing and what I would describe as irresponsible prescribing of painkillers.” Sales of opioid-based OxyContin skyrocketed after its release, growing hand-in-hand with overdose death rates through the mid-1990s and 2000s. Experts agree, however, that OxyContin over-prescription is not the only culprit. “It’s a misconception that we [doctors] write prescriptions for painkillers and then patients become addicts,” Dr. Jeffrey Singer, an Arizona-based surgeon and Fellow at the Cato Institute, said to TheDCNF. Singer cited a study estimating that just 8 to 12 percent of patients who were prescribed opioid-based painkillers became opioid addicts; he cited another study that estimated the patient-to-addict rate was less than one percent. Singer instead puts more blame on underlying “social pathologies” driving high addiction rates and counterproductive government policies like prescription monitoring programs that empower the illicit drug market’s power and profitability. Blake explained to TheDCNF that “this narrative” of prescriptions driving America’s drug crisis “has kind of stuck and [that] the Obama Administration pushed this when the data shows…what’s really been driving [the drug crisis] is this explosion in heroin… and other synthetic opioids” like fentanyl, which can be fatal to even touch. Regardless of how it came to be, America’s deadly opioid crisis quickly took root in the 1990s. In 1995, the year FDA approved OxyContin, ONDCP determined that 14,218 Americans had died of drug overdose. This figure increased nearly 270 percent to 52,404 deaths in 2015, breaking down to 144 deaths per day. More Americans died from drug overdose in 2015 than ever before. 2016 data have not been released yet by ONDCP or the Centers For Disease Control And Prevention (CDC), but a recent New York Times analysis estimates between 59,000 and 65,000 overdose deaths last year, coming out to between 162 and 178 deaths per day – which, if confirmed, would be a new all-time high. America’s ongoing drug epidemic is still the deadliest even if population changes are taken into account. CDC data demonstrate that 2015 drug-induced fatalities totaled a record 16.3 deaths per every 100,000 people in the U.S. In comparison, ONDCP’s data show that average yearly overdose deaths in the 1980s per every 100,000 people was 3.64. From 1985 to 1995 – after the crack epidemic was well underway to the year OxyContin was approved – yearly deaths per 100,000 people averaged just 4.45. ONDCP and CDC data may, moreover, be understating the reality of overdose deaths across the country. “Everyone in the policy community thinks it’s underestimated,” Blake explained to TheDCNF. Singer cited a New York City Public Health Department study indicating that 98 percent of overdose deaths in the city involve multiple substances; complicated post-mortem toxicology reports may obscure the primary drug that caused death. ONDCP and CDC statistics additionally do not include significant non-overdose drug-related deaths from gang and police violence, vehicle accidents caused by driving under the influence (DUI), and other health issues that were worsened by drug abuse. The future prognosis for America’s ongoing drug epidemic is moreover bleak. One STAT News analysis predicts that if the overdose death rate keeps growing at the same pace it has for decades, over 250 Americans could die from overdose each day by 2026, amounting to 93,000 annual deaths. 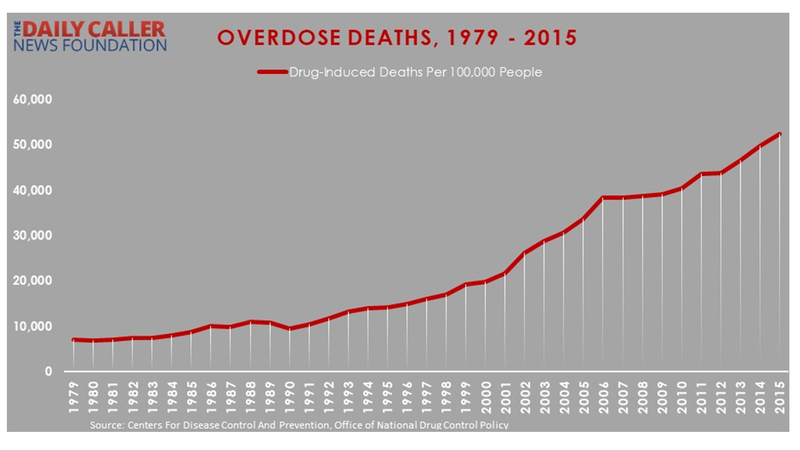 Regardless of future growth, Sessions’ claim that the “current drug epidemic is indeed the deadliest in American history” holds up to the facts.